We work with you to develop the best formats to suit your market. A customised retail proposition tailored to your local market needs will form the basis of a three-phase store development programme, consisting of (1) layout planning options, (2) interior look & feel and (3) detailed development packs. This programme will allow you to build SPAR stores that suit the needs of your local shoppers, ensuring the highest possible return per square metre. In 80+ years of business, SPAR International has developed an extensive range of manuals and workshops to help you implement world-class retail operation standards. Once we have worked with you on the roll out of the first SPAR stores, our team of retail operations experts will support you with a range of workshops varying from category management training to instore merchandising, waste management, staff management and many other topics to ensure the best possible store operations. As a partner you will be given the licence to the SPAR Brand and trademarks. To support the establishment of the SPAR Brand in your market you will have access to a wide range of marketing strategies, brand launch material and brand building best practice. SPAR also invests heavily in multiple annual sports sponsorship events, promoting the brand on TV and online to millions of customers. An efficient supply chain network is essential to a successful grocery retail business. SPAR International helps partners in the planning and development of efficient and cost effective warehouses, distribution centres and supply chain operations. We also work with you to improve existing supply chains by implementing end-to-end principles that will allow you to service shopper needs in the most efficient way possible. SPAR International provides licensed partners with access to a comprehensive range of SPAR Own Brand products and sourcing opportunities through its trading division. Core FMCG ranges, premium products and access to other SPAR country branded goods are also part of the offer. In addition, the SPAR licence enables SPAR Partners to develop their own complementary portfolio of SPAR branded products, utilising SPAR International Brand guidelines. The commitment of SPAR people to their jobs, their colleagues and the brand is undoubtedly one of the key success factors of SPAR. Partners are supported through ‘Train the Trainer’ programmes in HR principles, staff training, staff motivation, and off and online academies. 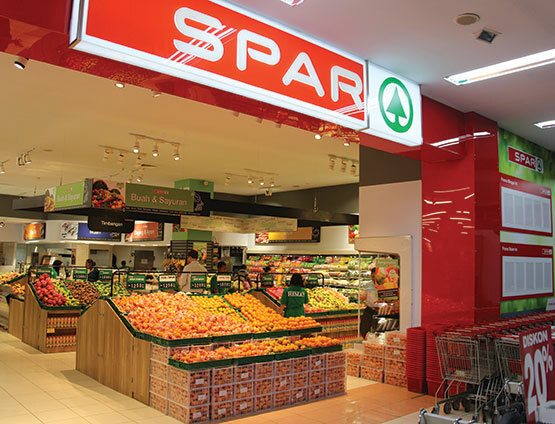 As a global retail brand, present in more than 45 countries with over 12,700 stores, SPAR is always looking for new opportunities to expand, working with wholesale and retail partners to the grow the worldwide business.